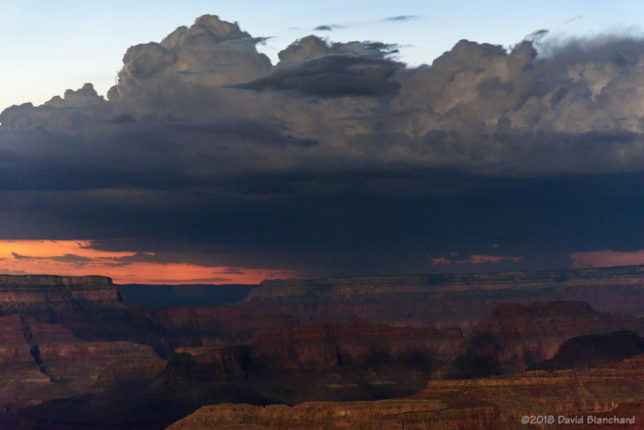 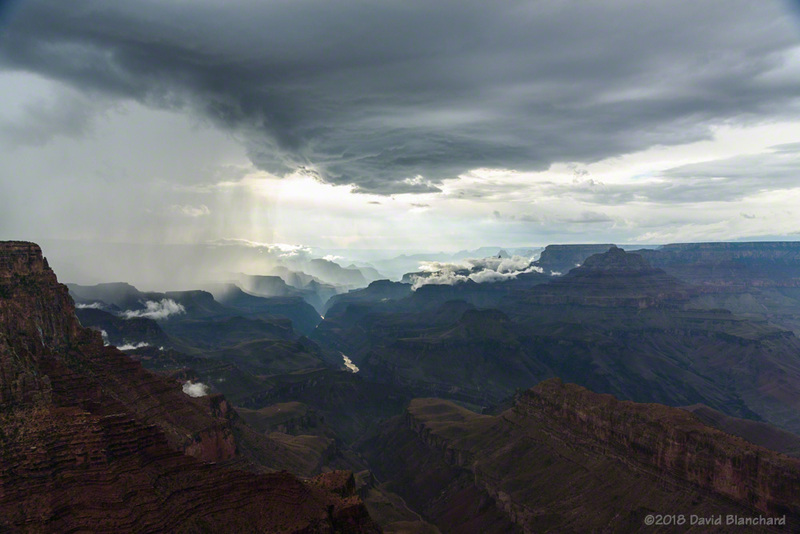 I have traveled up to the South Rim of Grand Canyon several times in the past few weeks to get interesting weather and cloud photographs. Fog begins to spill over the rim of Grand Canyon. 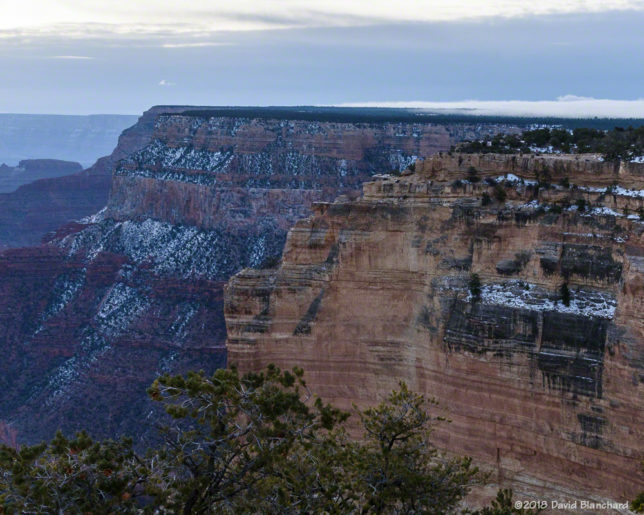 Two weeks ago, we spent two nights at the South Rim waiting for a winter storm to arrive and drop some snow on the higher elevations of the canyon. 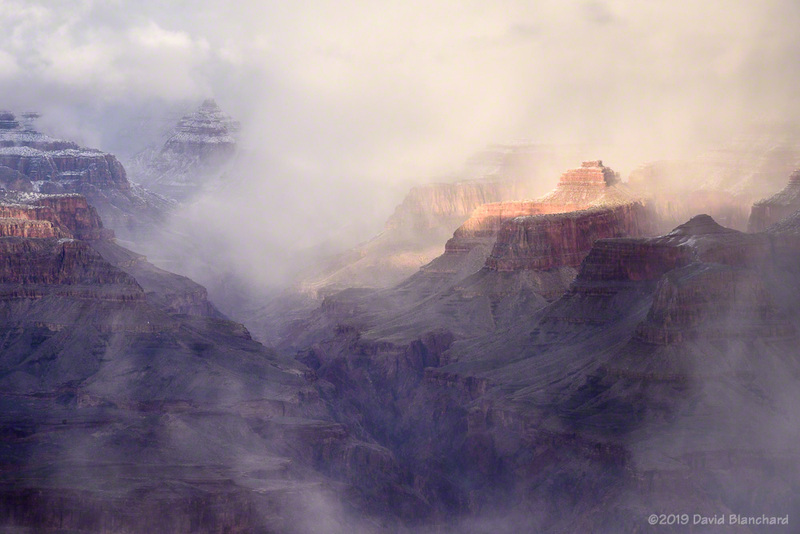 The storm went too far south and Grand Canyon got nothing but some clouds and a bit of fog. 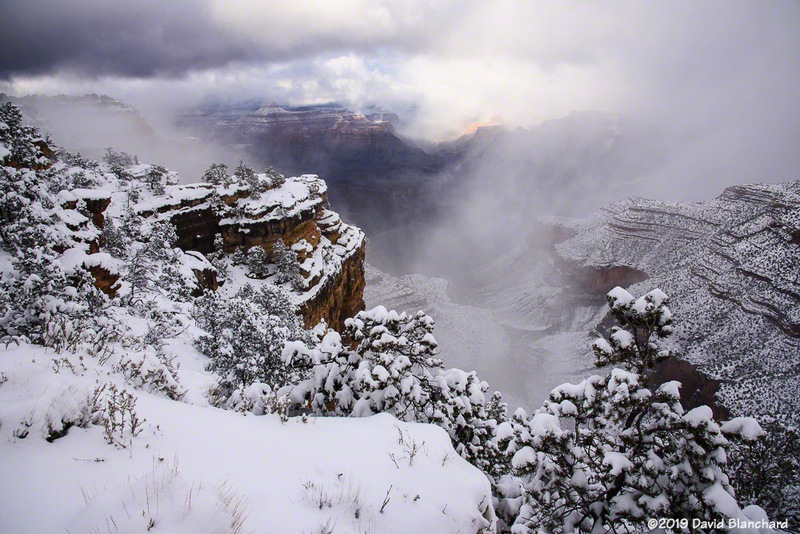 Flagstaff, on the other hand, got about 8″ on snow—which we had to clear from our driveway when we returned. 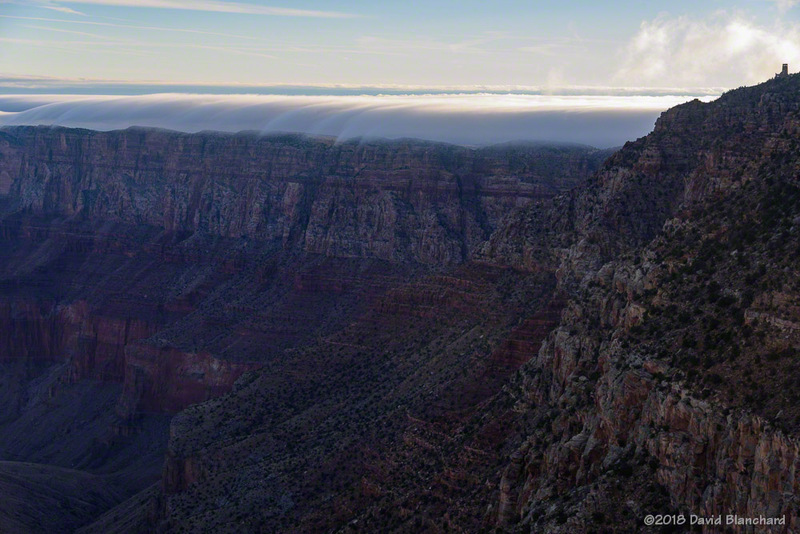 A thin layer of fog on the South Rim of Grand Canyon. A zoomed-in view of the fog on the canyon rim. 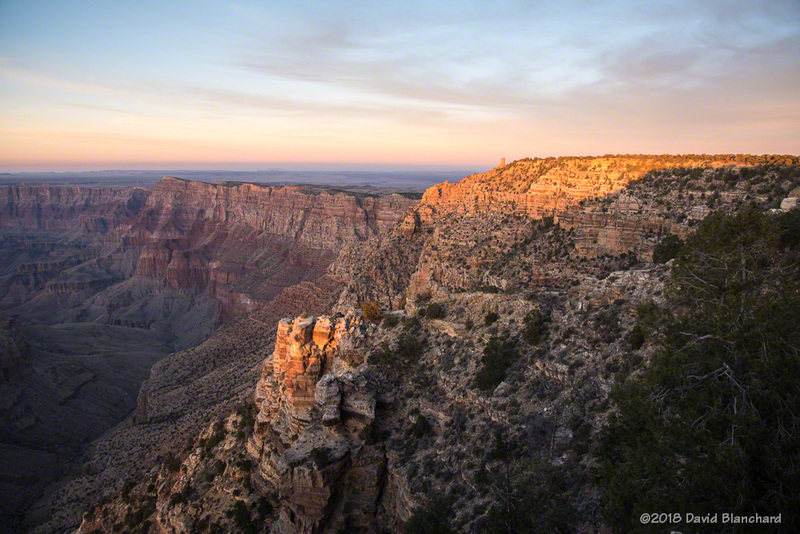 As the sun rose higher it illuminated the canyon below Hopi Point. The other goal on that trip was to catch the rising nearly-full moon as it climbed above Cape Royal on the North Rim. 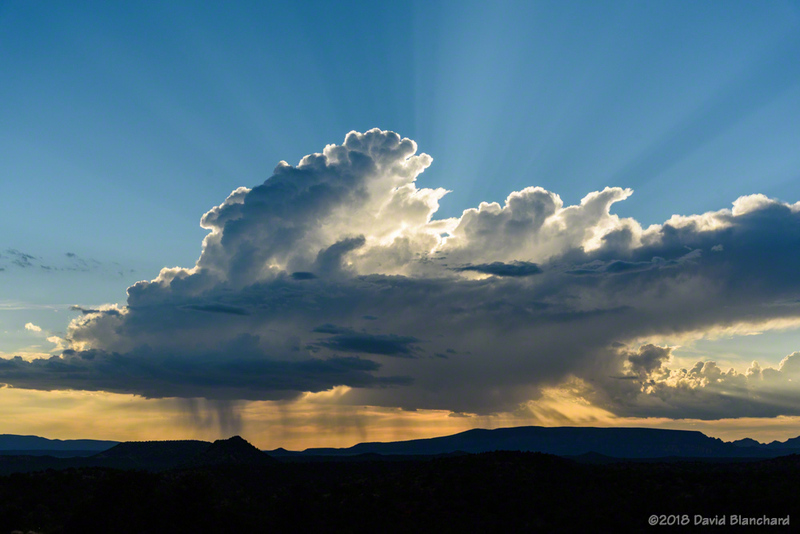 That worked out well as the clouds had dissipated by late afternoon. This image was shot as a 12-frame panorama (6 across, 2 rows) resulting in an image of ~200 megapixels. 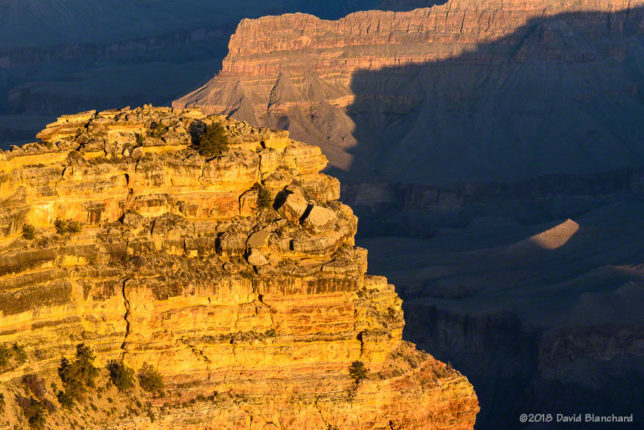 There is a lot of detail in the full-resolution image! 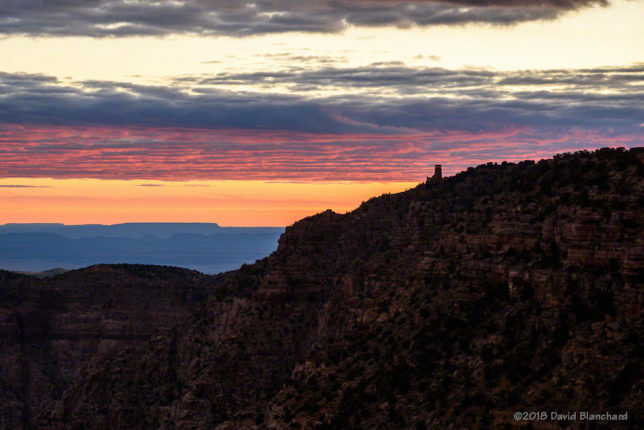 Moonrise above Cape Royal, Grand Canyon National Park. 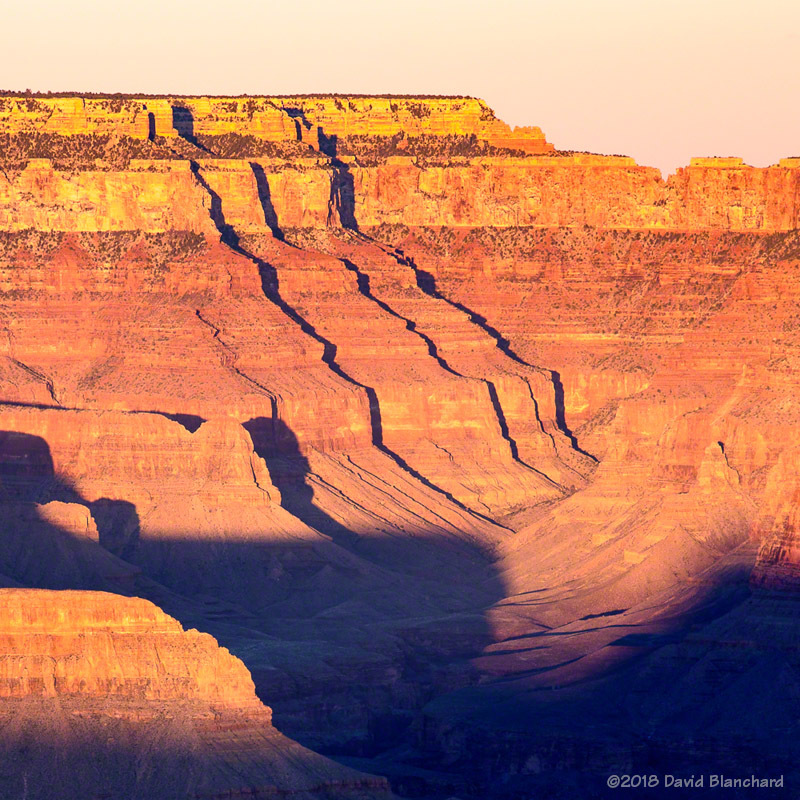 As the sun fell lower in the sky, shadows raced across the canyon bottom while some of the higher towers and buttes remained in the sun—resulting in some interesting lighting and abstract patterns. Late afternoon sun in Grand Canyon. Light and shadow create abstract forms on Cape Royal. Our final morning had some wave clouds forming downwind of the Kaibab Plateau and being lit by the rising sun. 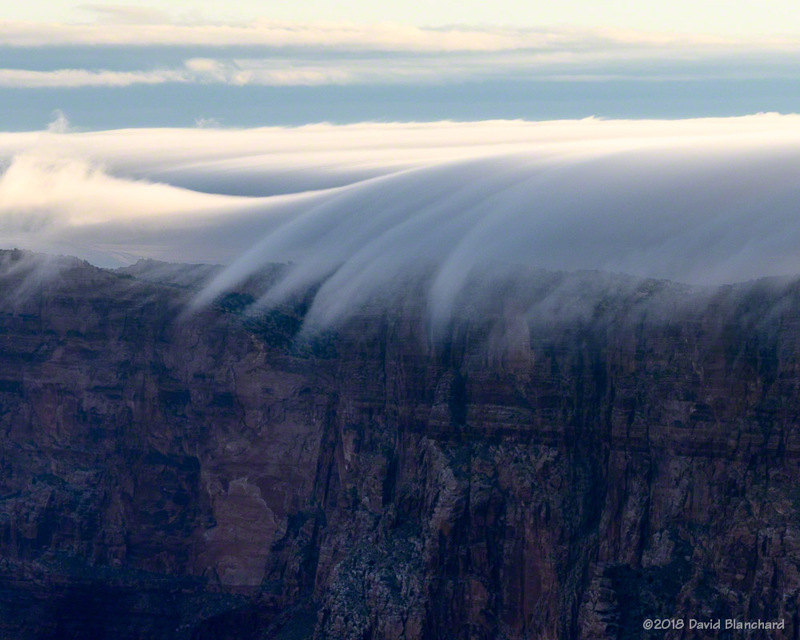 Wave clouds illuminated by the rising sun. 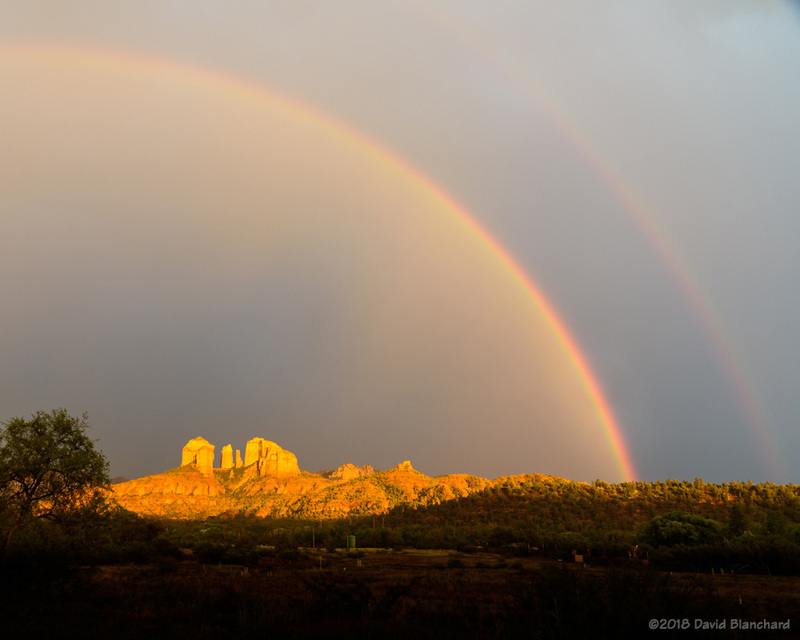 A few days ago we had a widespread rain event—even though rainfall amounts were not particularly large. 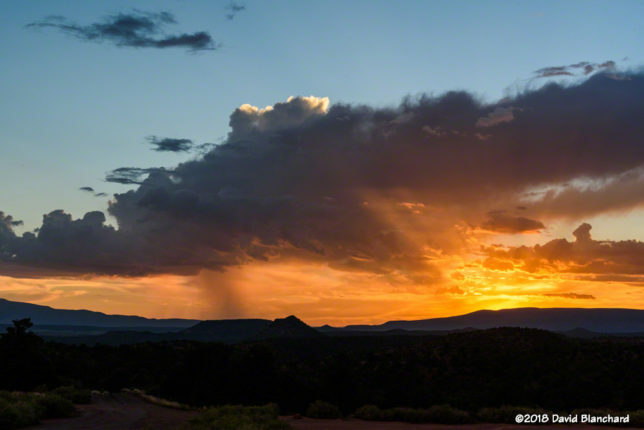 Most importantly, measurable rain fell in Winslow. 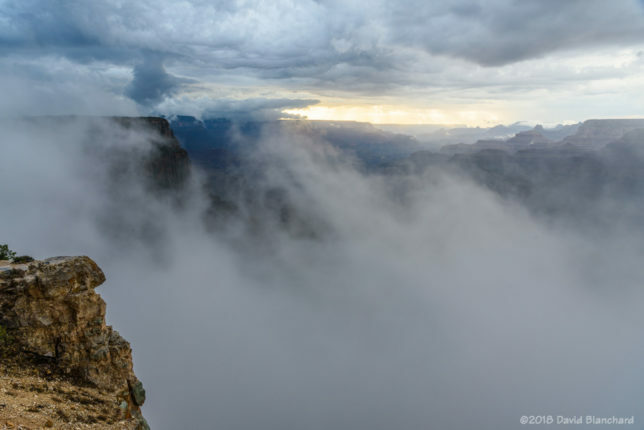 This meant that there was a possibility of fog forming in the Little Colorado River (LCR) Valley and drifting into the eastern reaches of Grand Canyon. 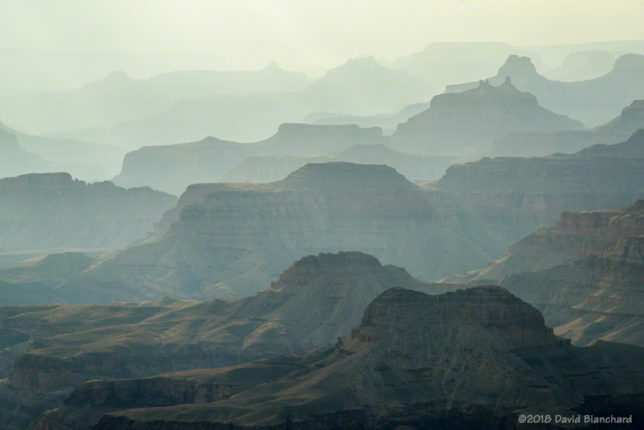 I arrived at Lipan Point on the South Rim before sunrise and could see some low-lying fog in the LCR well east of the canyon. As the sun rose and the land began to warm, the fog began to lift and move towards the canyon. 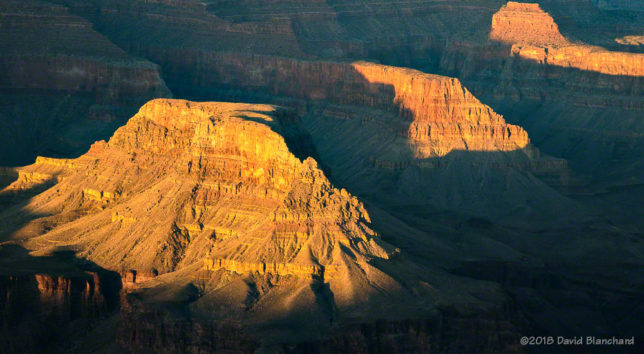 Eventually, it reached the Palisades north and east of Desert View Overlook. And, then, it began to spill over the sides evaporating only a short distance below the rim. 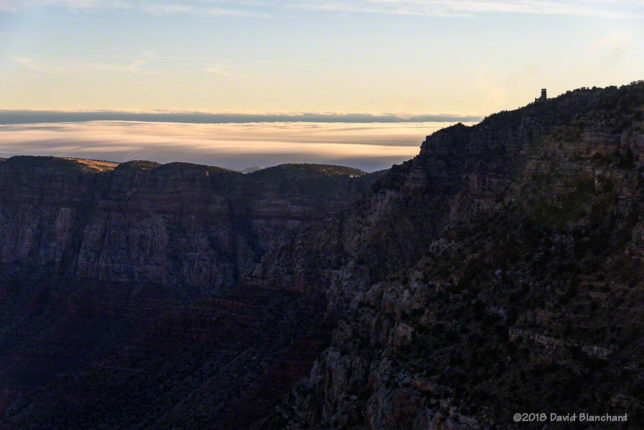 A shallow fog layer lies to the east of Grand Canyon at sunrise. Fog spills over the rim into Grand Canyon. 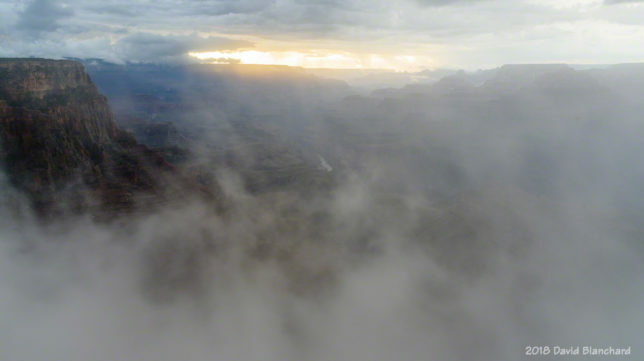 The fog soon swept across Desert View Overlook. 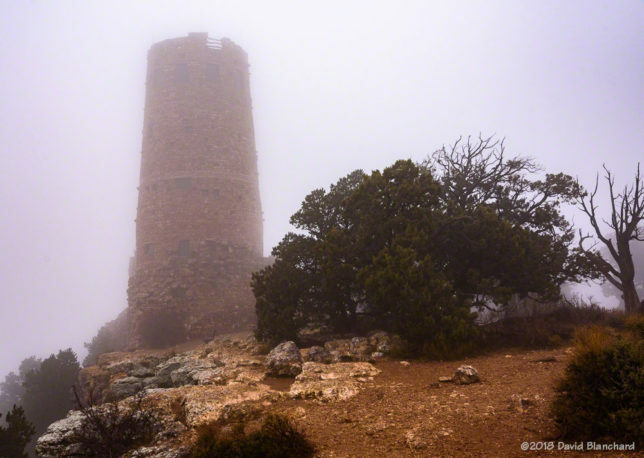 I headed over to Desert View to shoot photos of Desert View Watchtower in the fog—but the fog was so thick I had to get very close to even see it. 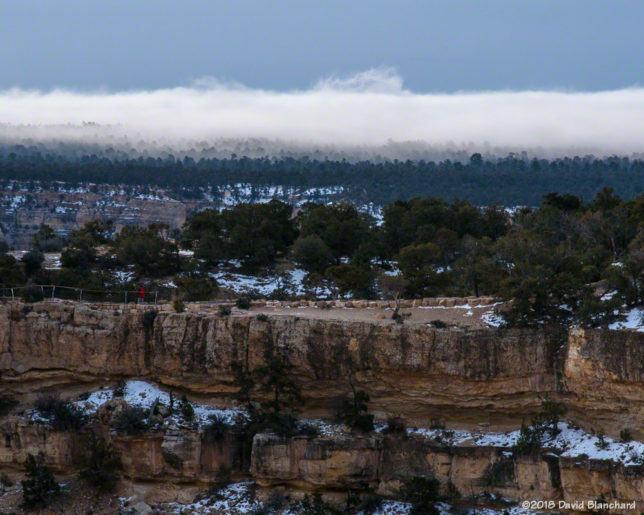 Fog swirls around Desert Watchtower. 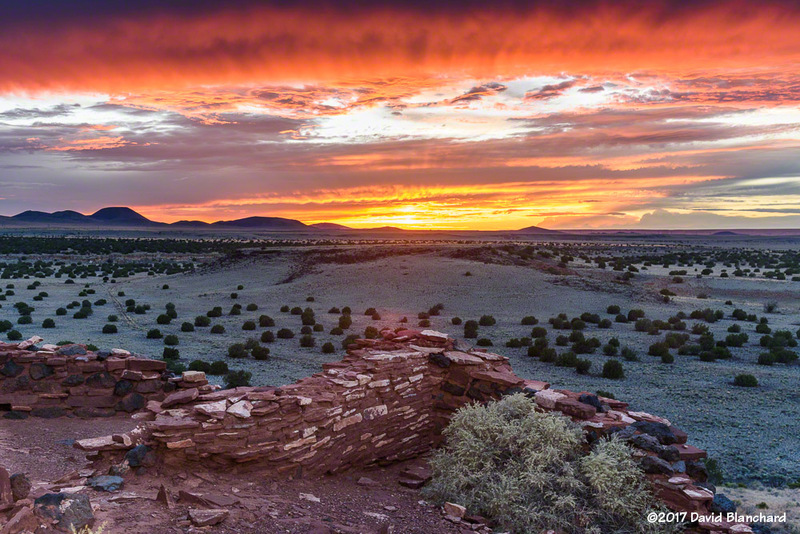 And—for just a moment—there was great color in the sky behind Desert Watchtower. A few days ago the Moon and Venus were very close together in the evening twilight sky. At sunset on Friday, the two objects were about 3° apart—about six moon diameters—with the Moon located up and to the left of Venus. 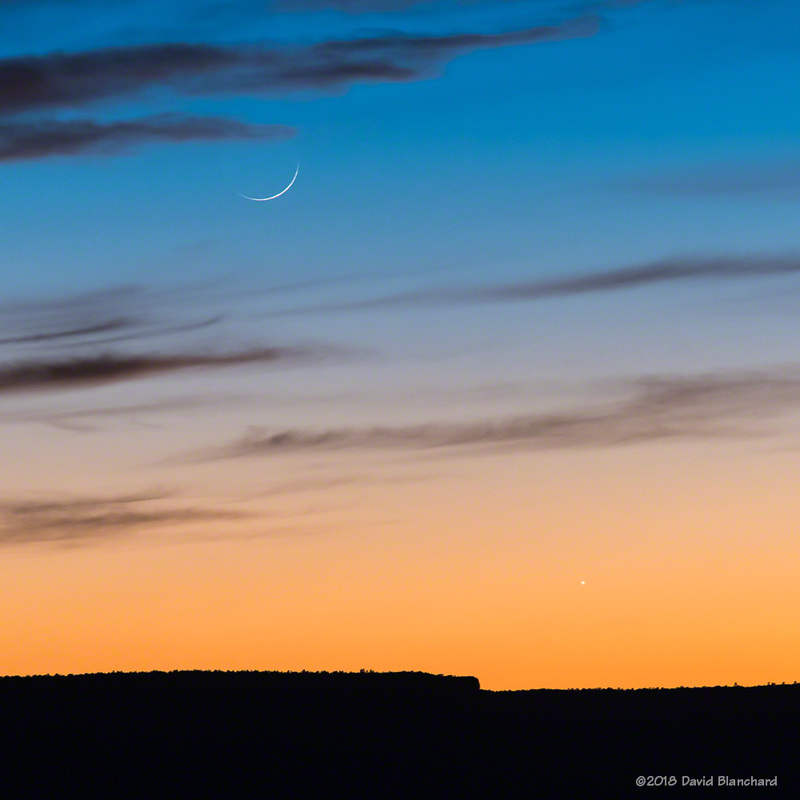 Crescent Moon and Venus in evening twilight. 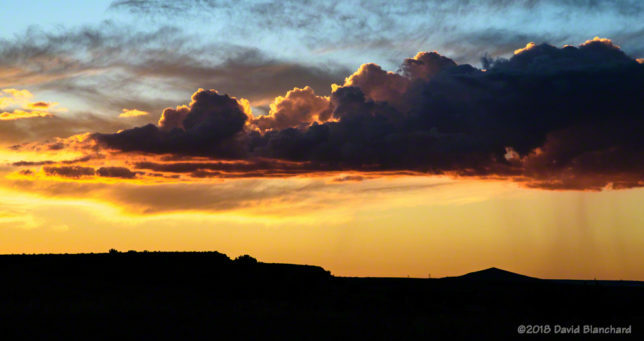 To view this I wanted a location with a very low western horizon. 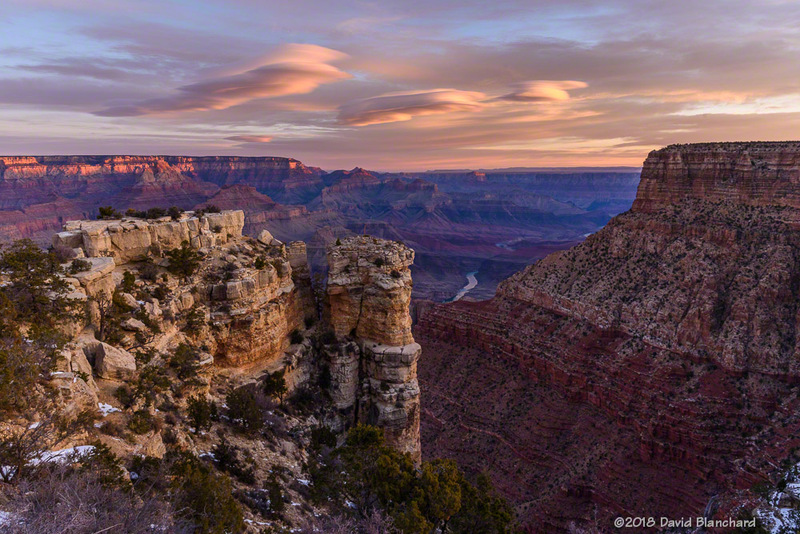 I chose to visit Navajo Point on the South Rim of Grand Canyon National Park. 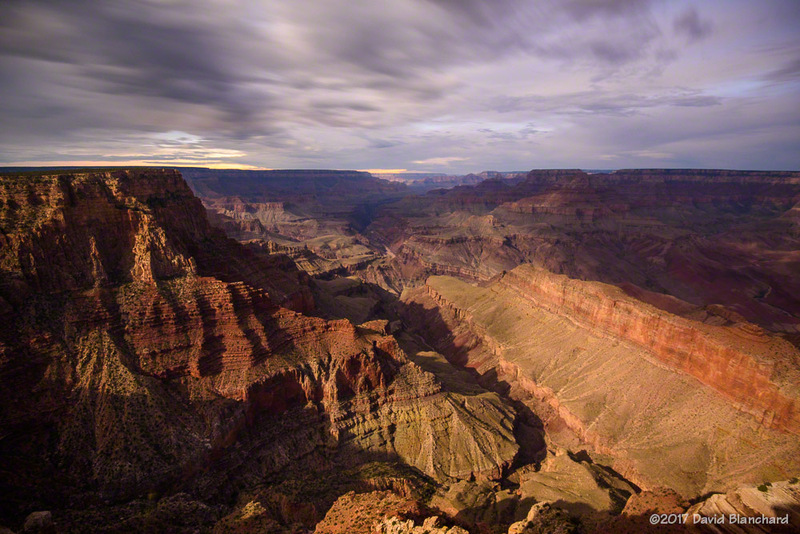 From this location, the rim to my southwest was actually slightly lower than my position giving me an unobstructed view. There was a nice sunset to start off the evening. The clouds were lit up and there was still enough light to fill in the lower canyon. 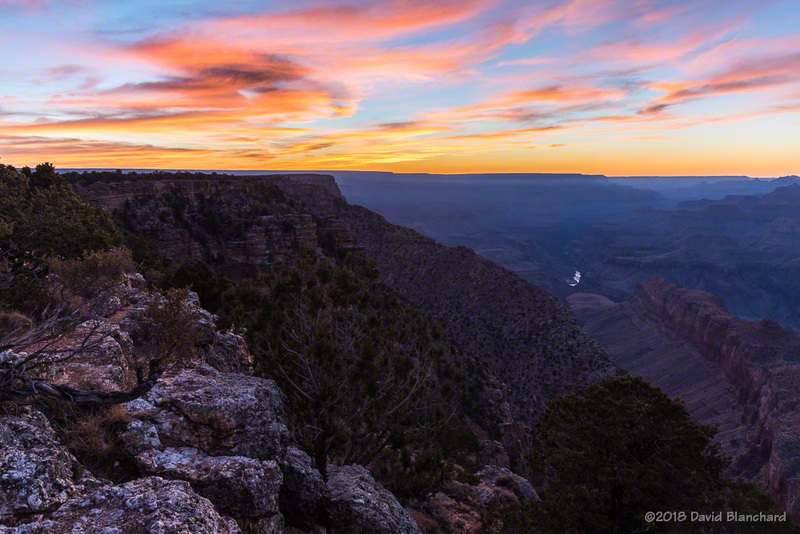 Sunset at Navajo Point, Grand Canyon. 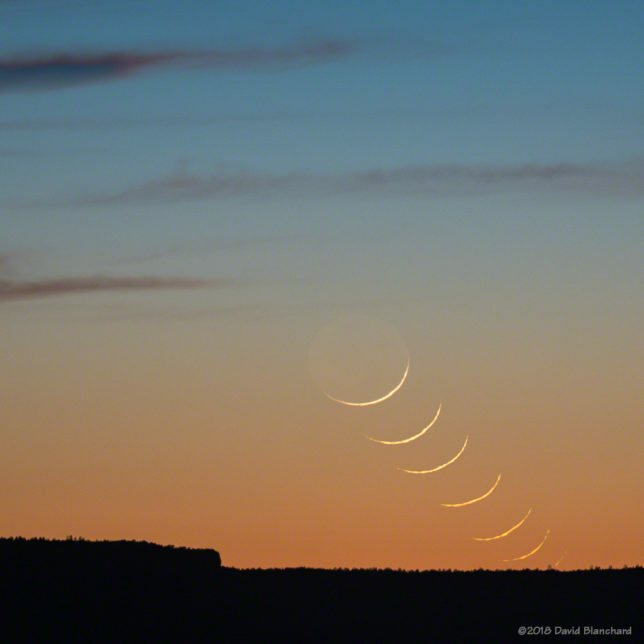 The moon was only one day past New Moon and was about 1.4% illuminated although there was a bit of Earthshine helping to illuminate the entire disk. Setting moon over the South Rim of Grand Canyon. 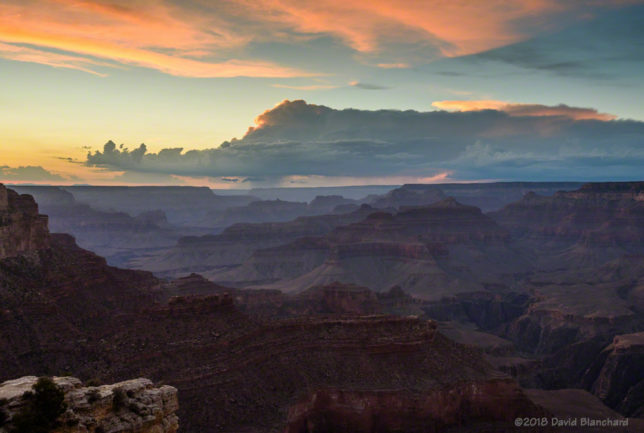 As the Moon approached the horizon, atmospheric effects resulted in the lower limb of the Moon being distorted. The final image is a composite taken over several minutes prior to moonset. In this composite it is easy to see the distortion of the lower limb. Of course, all this storminess brings opportunities for photographing interesting skies, lightning, and sunsets. 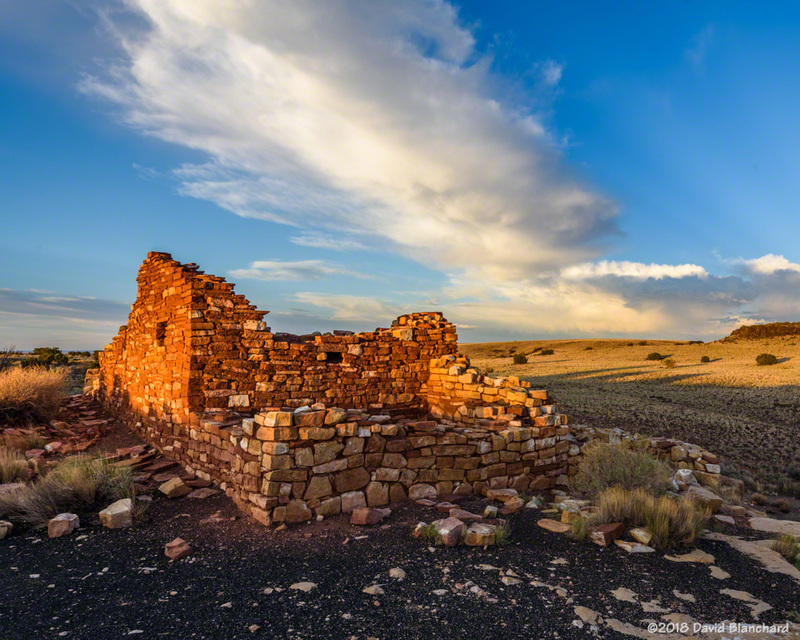 I was heading towards the South Rim of Grand Canyon when I decided that Wupatki National Monument might be more interesting. 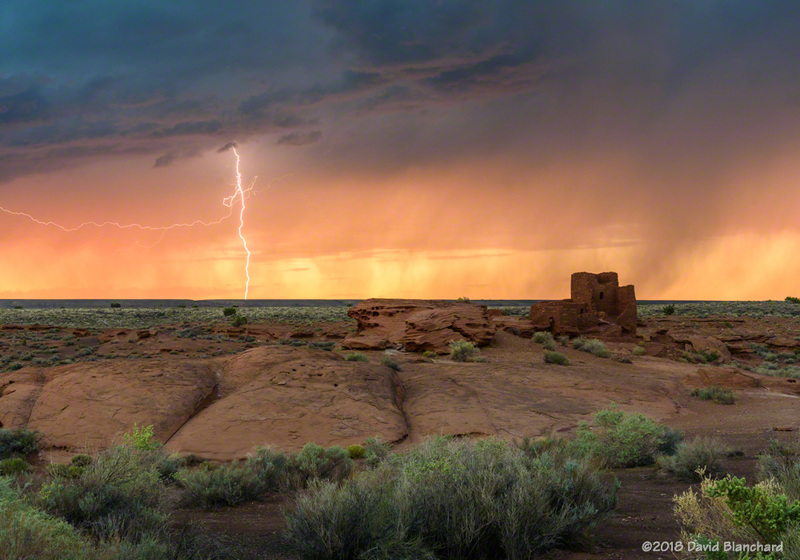 Although there wasn’t much in the way of lightning there was a nice sunset with a thunderstorm in the distance. Sunset at Citadel Pueblo in Wupatki National Monument. 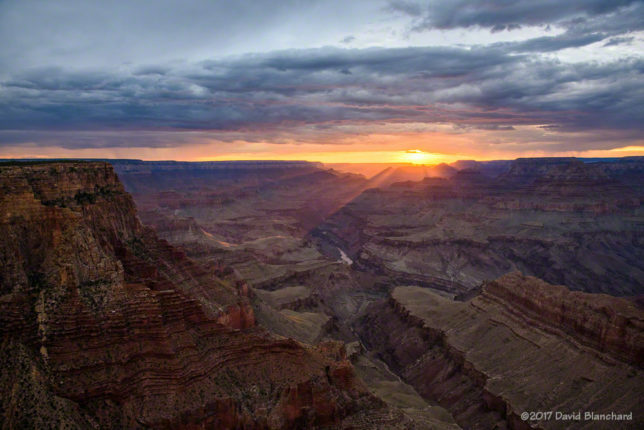 Another day brought a great sunset with beams of light illuminating the inner canyon. 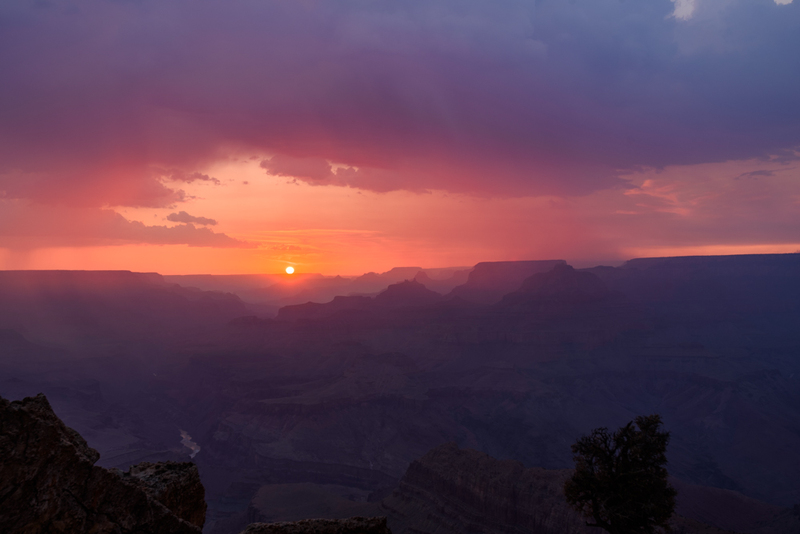 Sunset from Lipan Point, Grand Canyon National Park. I found myself in Sedona a few nights later hoping for lightning at sunset. 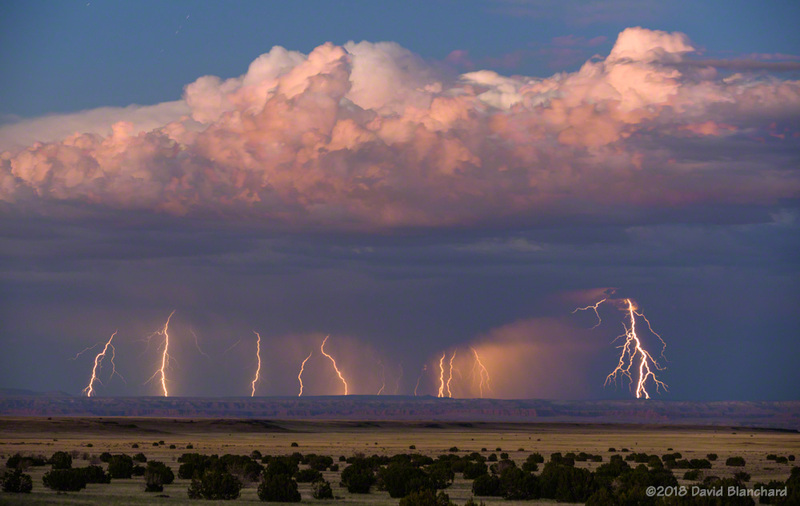 The lightning was there but clouds to the west blocked the light of the setting sun. 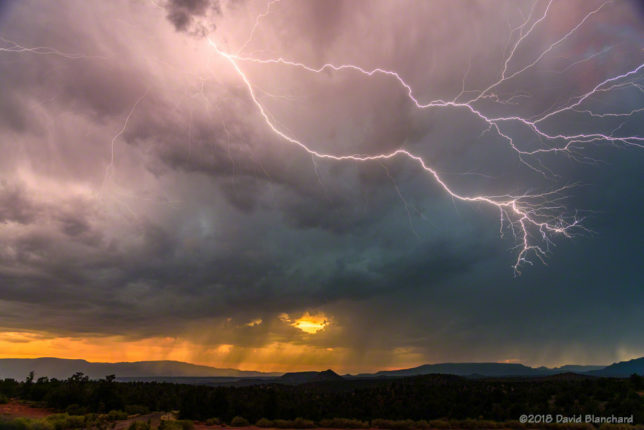 This spectacular bolt of anvil lightning traveled horizontally for a great distance before terminating above Cathedral Rock. 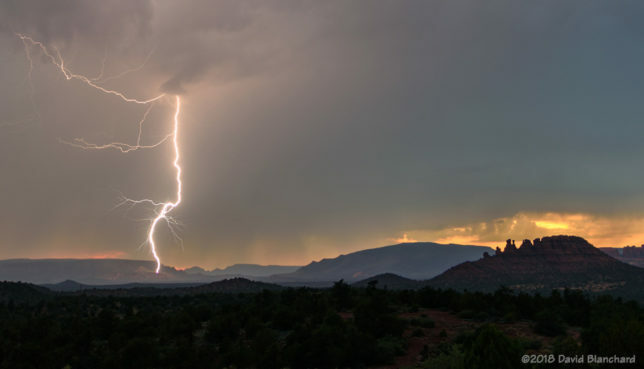 Lightning over Cathedral Rock, Sedona, Arizona. 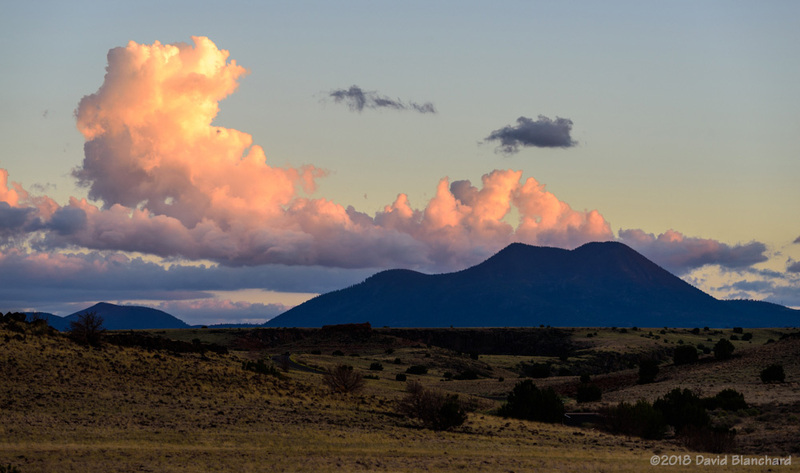 Early afternoon cumulus development near Marshall Lake on Anderson Mesa resulted in this small cumulus cloud producing a very photogenic shadow. 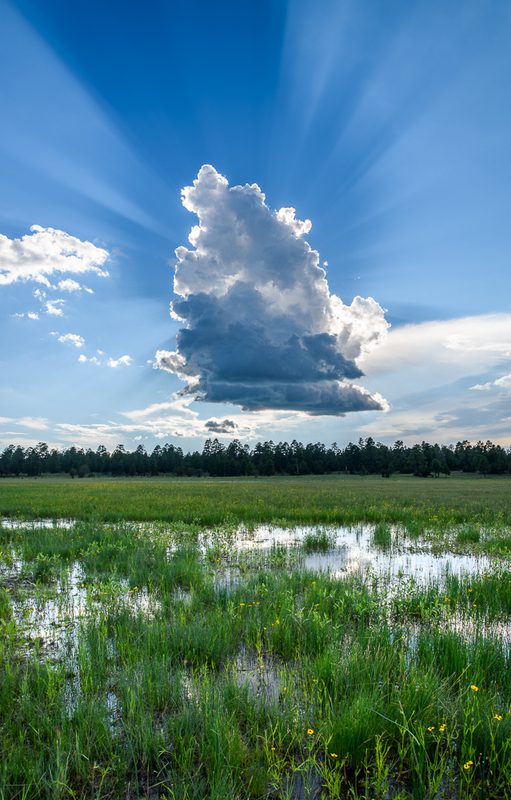 Cumulus cloud over Marshall Lake. 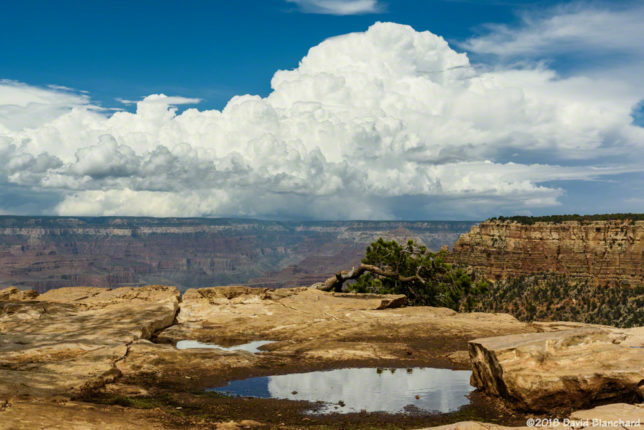 And, later that afternoon, we found ourselves at Lower Lake Mary watching another cumulus cloud develop to our east and reflected in the water. 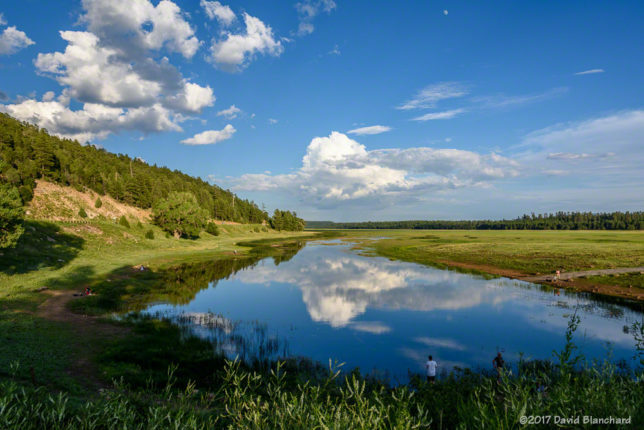 Cumulus cloud reflected in Lower Lake Mary. 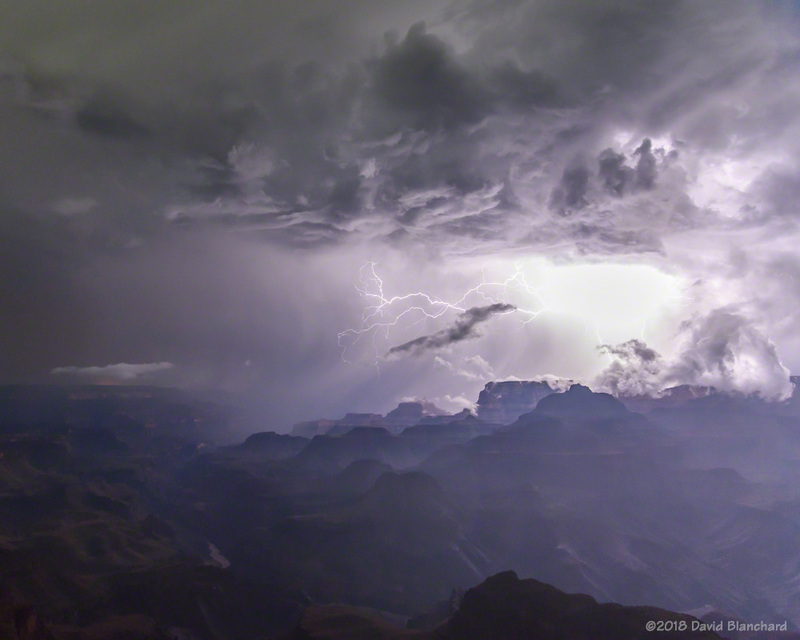 I’ve been trying to capture evening thunderstorms and lightning (image) over Grand Canyon with a crescent moon illuminating the interior the canyon. Not very easy to do. I was able to get the moonlit canyon. 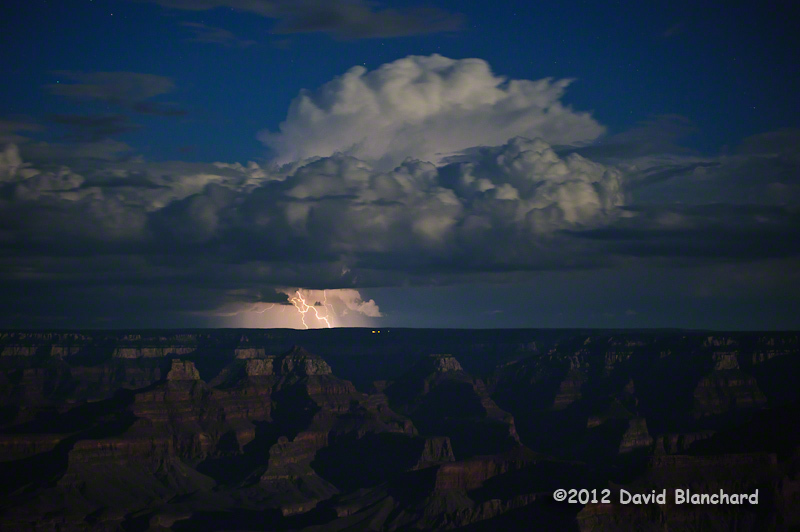 And there was lightning but it was over 100 km away and resulted in teeny, tiny bolts in the phots. Well, I’ll just keep trying.